The Atlanta Falcons visit the Seattle Seahawks in Week 11 of the 2017 NFL season. PFF previews the top player matchups of the game. 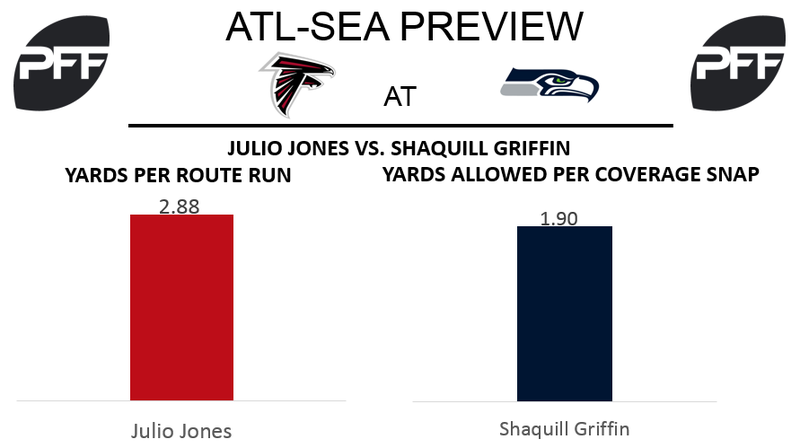 WR Julio Jones vs. CB Shaquill Griffin – Seahawks All-Pro cornerback Richard Sherman suffered a season ending Achilles injury last week and will unfortunately will he miss not only what would have been a marquee matchup this week, but also the remainder of the season. Instead, rookie cornerback Shaquill Griffin will step in to fill the massive void left behind by Sherman. Griffin has held his own so far this season by registering an overall grade of 75.0, which ranks 58th among cornerbacks in overall grade. The Falcons will likely test Griffin early and often with an All-Pro of their own in wide receiver Julio Jones. While Jones has not found the end zone very often this season, he still has maintained his elite level of play as he ranks first among wide receivers in yards per route run with an average of 2.88. RB Tevin Coleman vs. LB Bobby Wagner – The Falcons will be without the top-graded running back in the NFL in Devonta Freeman as Freeman suffered a concussion that will keep him out for Week 11. In his place, the Falcons will feature RB Tevin Coleman, who is a more than capable replacement for Freeman. While Freeman has earned the ninth-best elusive rating among running backs in the NFL so far this season, Coleman has also sported a respectable elusive rating of his own at 42.5, which ranks 24th out of 40 qualified running backs. In an attempt to slow down Coleman this week, the Seahawks will counter with linebacker Bobby Wagner who is as good a linebacker as they come. Throughout his career, Wagner has been one of the best run stopping linebackers in the NFL and this season has been no different. Through Week 10, Wagner ranks tied for fourth among 53 qualified linebackers in run-stop percentage at a rate of 12.5 percent. T Ryan Schraeder vs. 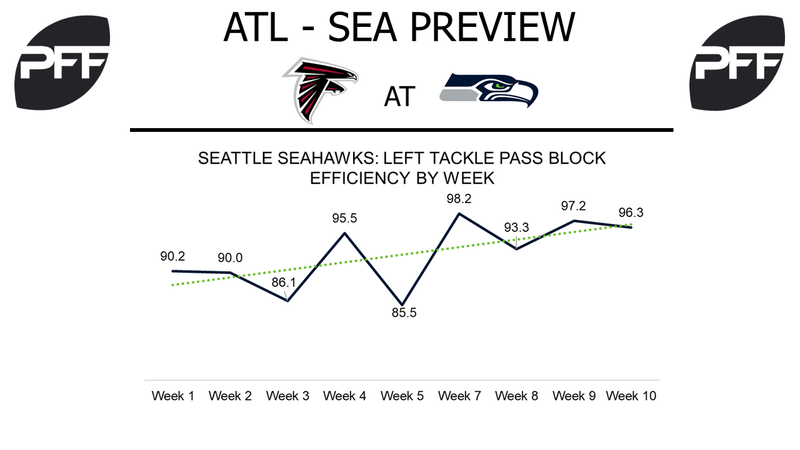 Edge Michael Bennett – The matchups between Falcons skill players and their defensive counterparts will start up front along the line of scrimmage, where Seahawks’ edge defender Michael Bennett will go up mainly against Falcons’ right tackle Ryan Schraeder. Bennett ranks 25th among edge defenders in overall grade with a grade of 84.1. Schraeder has had a decent year, as he ranks tied for 38th among all tackles in overall grade with a grade of 70.6. T Duane Brown vs. Edge Brooks Reed and Adrian Clayborn – Brown will need to be 100 percent for his matchup against these two edge defenders in Week 11. Reed owns a pass-rush grade of 80.8 (22nd) while Clayborn is coming off of a 99.9 overall game grade that saw him generate six quarterback sacks and puts his pass-rush grade at 90.8 (4th). Since joining the Seahawks, Brown has the 12th-highest pass-blocking efficiency among all tackles with a 96.9, while his three quarterback pressures allowed ranks tied for 10th-fewest. In those two weeks, Russell Wilson has gone from the second-fewest drop backs without pressure, to the fifth-fewest and owns the seventh-highest passer rating on such drop backs with a 107.5. WR Paul Richardson vs. CB Desmond Trufant – With Paul Richardson splitting time on both the left and right side, expect these two to meet when he goes to the far right. Richardson has receptions of 35 or more yards in three of his last four games and has four such receptions this season. Trufant has given up only one pass of 25 or more yards on the season, while the longest pass he has given up in any game has averaged only 15 yards. Hitting the homerun ball has been huge for the Seahawks this season, as they have averaged 33.3 points per game when Richardson has caught a pass of 37 or more yards, as compared to only 15.6 when he doesn’t. WR Doug Baldwin vs. CB Brian Poole – Baldwin has run the fourth-most routes from the slot since Week 6 (112) among all wide receivers, while averaging 1.97 yards per route run. That mark ranks fifth among all receivers in that time span, but he is the only receiver with at least 100 routes run from the slot to average more than 1.67 yards per route run. The guy that will see the most of him will be slot cornerback Brian Poole. Poole has allowed the 11th-highest passer rating into his coverage when in slot coverage with a mark of 100.1, and has allowed an average of 1.38 yards per coverage snap against him (eighth highest) on 244 slot coverage snaps. The last two times the Seahawks and Falcons played 2016, Baldwin did not see one target in Poole’s coverage, with one of those games coming in the divisional playoffs.